I meant to post this on Sunday but I didn't get to finish it in time to post it. This was the complementary colors last Thursday for the Hero Arts blog. I had a hard time working with yellow and purple and it's probably because these colors remind me of Easter. 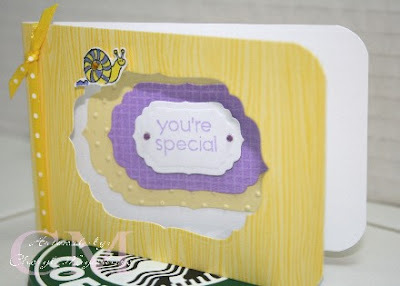 Once again I used the woodgrain stamp for the card background and the screen shadow stamp for the purple piece. The word stamp and snail are both from the Ink 'n Stamps sets. I have to share this with you because I have never seen anything like it before. 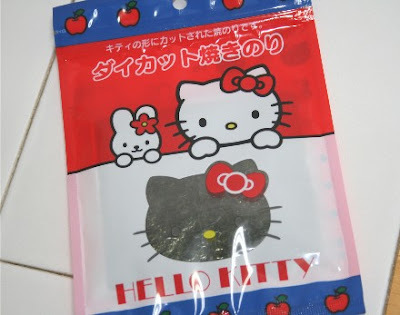 My daughter just came back from a trip to Japan and she bought some packages of Hello Kitty shaped nori. It's the cutest thing! You make your musubi and put the Hello Kitty nori face on it. There are all kinds of shapes but she just bought a couple different ones. 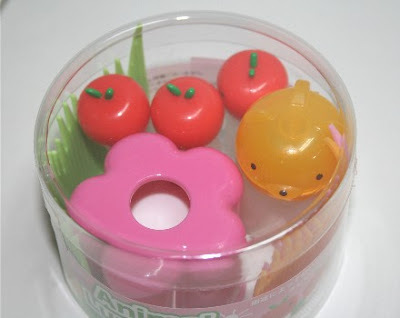 And these little plastic things here are for your condiments when you make your bento lunch. 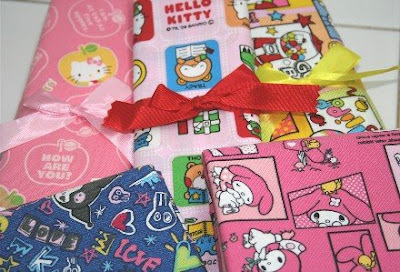 These were the best because she brought me back all these Hello Kitty fabrics. They're so cute that I don't even want to cut them up. I'll probably end up making some quilts with them. She did request a tote bag for herself. Thanks for stopping by today and hope you're having a great week!!! Hello Kitty nori? How cute is that! You're so lucky your daughter knows all the fun and cute stuff to get in Japan! Oh, those Hello Kitty fabrics are so cute - I think my dau found other character shaped nori at Marukai but not sure it was Hello Kitty. Now you can make cute musubis and bags for your family. Cute card, but you're right, those remind me of Easter too! Didn't know that Michelle went to Japan, but she brought back some great goodies for you! I can just imagine a cute quilt using those HK fabric!! Only in Japan can you get those neat and cute stuffs. So much fun shopping there. OMG---love, love, love the My Melody fabric!! Didn't know she was still around....great job on the card. Those are not easy colors for me, either! great stuff! love all those neat HK stuff from Japan! my mom will be going there soon...I am definitely tell her to buy me some HK stuff from there! TFS! Awesome goodies Cheryl! Your card is great. Love the HK fabric! :) Have a great day! HK nori, and fabric!! How awesome!! I would not want to cute the fabric either. BTW, I have a blog award for you... after all your blog is what inspired me to create my own blog! Thanks! WOWEE, what a truckload of HK goodies! Lucky you! Japan has the cutest things ... I wish that one day I will be able to take a vacation and travel to Japan! TFS! That HK Nori is FUNNY!!! You gotta make one, and share with us how it looks. Can't wait!!! Those materials looks fun to work with. Looking forward in seeing what the tote looks like.